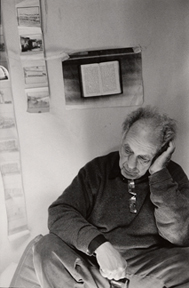 In the spring of 2000, Robert Frank invited my friend Peter and a group of his Swedish photography students to his studio at Bleecker Street. Where he has been living and working for many years. Peter and I had been going to the photography school and Peter extended the invitation to me. Born in Switzerland in 1924, Frank is considered one of the great living masters of photography. Frank is undoubtedly best known for his book, THE AMERICANS made on a cross-country road trip in 1955–56.Frank’s depiction of American life the book was released in the U.S. in 1959.Frank's style—seemingly loose, casual compositions, with often rough, blurred, out-of-focus foregrounds and tilted horizons—was just as controversial and influential as his subject matter. When we arrived, Mr. Frank opened the door, welcomed us and signaled for us to follow him to the second floor through narrows stairs to a small room, which he used as his studio. I remember the debris and the scraps of papers crumpled and thrown on the studio floor, the wall full of books and another wall of pictures. I recognized one of the corners as the background for a self-portrait he has made that became the cover of his book MOVING OUT. Every thing in the room felt like an experiment in living held together to keep the experiment going. All of it was both regular and unpredictable. There was no apparent order but rather a place where inherent suffering is acknowledged. This I felt was many times more hopeful and helpful than safe mediocrity. What we took away that day, on the most profound level, increases our awareness of our own Possibilities. METROPOLITAN MUSEUM OF ART: ‘LOOKING IN: ROBERT FRANK’S “THE AMERICANS,”’ through Jan. 3.